We studied species richness, composition and vertical distribution of epiphytic bryophytes in submontane rainforest of Central Sulawesi. Bryophytes were sampled on eight canopy trees and on eight trees in the forest understorey. Microclimate was measured at trunk bases and at crown bases. The total recorded number of 146 epiphytic bryophyte species is among the highest ever reported for tropical forests and underlines the importance of the Malesian region as a global biodiversity hotspot. Species composition differed significantly between understorey trees and canopy tree trunks on the one hand, and the forest canopy on the other. Fourty-five percent of the bryophyte species were restricted to canopy tree crowns, 12% to the understorey. Dendroid and fan-like species mainly occurred in the forest understorey whereas tufts were most species rich in the tree crowns. The findings reflect the different microclimatic regimes and substrates found in the understorey and in the forest canopy. The results indicate that assessments of the bryophyte diversity of tropical forests are inadequate when understorey trees and tree crowns are excluded. Tropical rainforests, especially montane forests, are rich in epiphytic bryophytes (Richards 1984; Frahm and Gradstein 1991; Parolly and Kürschner 2004). These plants play an important role in the water balance and nutrient cycling of the forest (Pócs 1980; Nadkarni 1984; Hofstede et al. 1994; but see Hölscher et al. 2004), and function as substrate, food source and nesting material for numerous other rainforest organisms (e.g., Nadkarni and Matelson 1989; Yanoviak et al. 2007). Several recent studies have described the species composition and richness of epiphytic bryophytes at different height levels on rainforest trees, as well as substrate preferences within the host trees (e.g., Cornelissen and Ter Steege 1989; Wolf 1993a, b, 1996; Gradstein et al. 2001b; Holz et al. 2002; Acebey et al. 2003). Bark structure and microclimate were identified as key drivers of epiphytic bryophyte distribution within the forest. Due to the lack of a protective cuticle, bryophytes are sensitive indicators of climatic conditions (Gignac 2001; Léon-Vargas et al. 2006; Zotz and Bader 2009), and environmental changes, e.g., in insolation or air humidity, may result in rapid community composition changes and vertical shifts of bryophyte assemblages on host trees (Barkman 1958; Acebey et al. 2003; Frego 2007). In comparison, chemical bark factors seem to play a minor role in shaping epiphytic bryophyte distributions in rainforest (Frahm 1990) and also host specificity is rare among tropical bryophytes (Pócs 1982; Richards 1984; Kürschner 1990). It has also been shown that bryophytes are not evenly distributed within the forest and that the forest canopy may harbour many more species than the understorey (Gradstein 1992a). The vertical distribution of epiphytic bryophyte assemblages within the rainforest can be related to the microclimatic preferences of individual species. Some occur exclusively in the moist, shaded understorey and lower canopy of the forest, others are found only in the drier, outer portions of the forest canopy high above the ground; some occur in both habitats. Following Richards (1984), these ecological groups are called “shade epiphytes”, “sun epiphytes” and “generalists”, respectively. Based on life form (Mägdefrau 1982), shade epiphytes can be recognized by their exposed growth (e.g., tufts, pendants, carpets) that maximises light exposure while sun epiphytes are usually compact and prostrate to reduce water loss. Shade epiphytes, are thus generally less well adapted to desiccation than sun epiphytes and generalists, and are more seriously affected by forest disturbance (Gradstein 1992b, 2008; Acebey et al. 2003). In spite of the recent upsurge in ecological research on rainforest bryophytes, our knowledge of vertical distribution and microhabitat specificity of epiphytic bryophytes in rainforests remains incomplete. First, most studies have been carried out in tropical America, and very few in the Old World tropics. Second, almost all epiphyte studies in the natural forest have hitherto focused on mature canopy trees; species on young understorey trees have generally been neglected (Krömer et al. 2007). Third, descriptions of vertical distribution patterns have generally been observational; very few studies included statistical analysis of the data (Holz et al. 2002; Holz and Gradstein 2005). In this study, epiphytic bryophyte distribution was studied in natural rainforest on the island of Sulawesi, Indonesia. In Southeast Asia, studies on epiphytic bryophytes have to date been restricted to more easily accessible tree trunk bases (Frahm 1990; Kürschner 1990; Ariyanti et al. 2008); this is the first study that includes sampling of whole trees. The purpose of this paper is to analyse the vertical distribution of species richness, species composition and bryophyte life forms on whole forest trees. In addition to diversity patterns on mature host trees, attention is paid to the hitherto neglected diversity of epiphytic bryophytes on the young trees of the forest understorey. The study area was located at the western border of Lore Lindu National Park (120°1′–120°3′30″E 1°29′30″–1°32′S, 800–1100 m a.s.l. ), Central Sulawesi, Indonesia, near the village of Toro (Ariyanti et al. 2008; Sporn et al. 2009). Annual rainfall in the area is 2000–3000 mm, without clear seasonal fluctuations (Gravenhorst et al. 2005). Within an altitudinal range of 950–1100 m, four submontane forest sites of 1 ha each were selected for this study. Sites were sloping at an inclination of 20–30°, forest canopy cover was over 95%, canopy height was 25–45 m and human disturbance was minor (rattan extraction, collection of medicinal herbs). In each study site, air temperature (°C) and relative humidity (%RH) were measured at 2 m height and at the ramification that marked the base of the tree crown, using data-loggers (HOBO RH/Temp, ©SYNOTECH). Measurements were taken in July 2005 during one week in each site (Sporn et al. 2009). In each study site, two mature canopy trees and two understorey trees minimally 15 m apart were selected randomly; however, to minimize variation in substrate conditions, all selected trees were smooth-barked. Understorey trees were 3–6.5 m in height and dbh was 20–60 cm. Canopy trees were 30–45 m in height and dbh was 2–6.5 m.
Epiphytic bryophytes were sampled in quadrats of 200 cm², positioned at each cardinal direction in six height zones on canopy trees (zones Z1, Z2a, Z2b, Z3, Z4 and Z5; Johansson 1974) and in three height zones on understorey trees (U1 = trunk from base to first ramification, U2 = inner crown, U3 = outer crown). Canopy trees were accessed using the single rope technique (Ter Steege and Cornelissen 1988); for safety reasons, thin canopy branches (zones Z4, Z5) were cut and lowered to the ground for sampling. Total bryophyte cover (%) was estimated for each quadrat. In total, 24 quadrats (4800 cm²) per mature tree and 12 quadrats (2400 cm²) per treelet were sampled. Bryophytes were identified using taxonomic literature (see Gradstein et al. 2005) and reference collections from the herbaria of the University of Göttingen (GOET) and Leiden (L), or sorted to morphospecies. Moss species identification was in part done with the help of specialists. Bryophyte species were assigned to the following life forms: dendroid, fan, mat, pendant, tail, short turf, tall turf and weft (Mägdefrau 1982). Vouchers were deposited in the herbaria BO, CEB, GOET and L.
To assess overall sampling completeness and sampling completeness per tree type, we used the Chao2 species richness estimator (as recommended by Herzog et al. 2002; Walther and Moore 2005). To test for differences in species richness between sites, trees and height zones (Z1–Z5, U1–U3), we used general linear models (GLMs) with Type I hierarchical variance decomposition. “Site” was entered first, followed by “tree” and “zone”. All were entered as random variables. To quantify differences in species composition between sites and zones, we calculated Sørensen’s similarity index for each pairwise comparison of zones per site. Using non-metric multidimensional scaling (MDS), we reduced the similarity matrix to a dimensional scaling. Stress values below 0.20 were considered to indicate a good fit of the scaling to the matrix. With analyses of similarity (ANOSIM), differences in species composition between sites and zones were tested. All analyses were carried out for overall bryophytes and separately for mosses (Bryophyta s.str.) and liverworts (Marchantiophyta). Chao2 richness estimates were calculated using EstimateS (Colwell 2004), GLMs and MDS with Statistica 7.0 (StatSoft Inc 2001), and Sørensen’s similarity index and ANOSIM with Primer 5.0 (PRIMER-E Ltd 2002). The daily fluctuations in microclimate showed steepest changes between 7:00 am and 7:00 pm (Fig. 1). In the forest canopy, air temperature was on average 1.6°C higher and relative air humidity 4.9% lower than at trunk bases (Fig. 1). 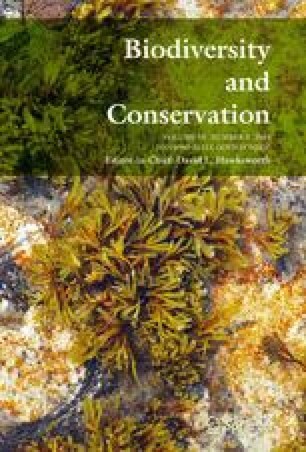 In total, 146 bryophyte species (87% of the estimated) were collected including 84 species of liverworts (85% of the estimated) and 62 species of mosses (91% of the estimated, Fig. 2). Fifty species (= common spp.) occurred in more than 10% of all samples; 24 of these species were found in only one tree zone. Seventy-six species or 82% of estimated total species richness were recorded from understorey trees, and 133 species or 88% of estimated total richness from canopy trees (Fig. 2). Overall bryophyte richness and liverwort richness differed significantly between trees and zones (Table 1) with highest values in Z3 and lowest values in Z1; that of mosses differed significantly between zones but not between trees (Fig. 3; Table 1). No significant differences in species richness between sites were found (Table 1). Lejeuneaceae (liverworts) was the most species-rich family, representing 37% of all bryophyte species recorded, followed by Plagiochilaceae (9%, also liverworts), Neckeraceae (6%, mosses), and Frullaniaceae, Hookeriaceae and Meteoriaceae (5% each). Fourty-eight percent of species were only found on canopy trees, with 3% restricted to trunks (none exclusive to zone Z1) and 18% to tree crowns. Eleven percent of all species were exclusively found on young trees in the forest understorey. The first two dimensions of the multidimensional scaling of the Sørensen’s similarity index reduced more than 77% of the raw stress with stress values below 0.20. Within understorey trees, species composition did not differ between zones (Table 2). Here, species assemblages were also similar to those on zones 1 and 2 of canopy trees (Table 2). Within canopy trees, the ANOSIM results showed significant composition dissimilarity between Z1 and Z3, Z4 and Z5 (Table 2). Thus, epiphytic bryophyte assemblages in the study sites can be divided in two groups, those on understorey trees (U1, U2, U3) and in zone 1 of canopy trees, and those in the crowns of canopy trees (Z3, Z4, Z5). Zones 2a and 2b form a transition zone between the understorey and the canopy in terms of bryophyte composition. Seventy percent of all collected bryophytes species were smooth mats (47%) or wefts (23%); species belonging to these categories occurred on all sampled trees. Other life forms each included less than 10% of all species (Fig. 4). The richness of pendants, mats, short turfs, tails and wefts did not differ between zones. However, dendroids and fans were significantly most numerous in the forest understorey, whereas tall turfs occurred only in the forest canopy layer. The recorded number of 146 epiphytic bryophyte species on eight understorey and eight canopy trees (estimated sampling completeness: 88% for canopy trees, 82% for understorey trees) is among the highest ever reported for tropical forests (e.g., Cornelissen and Ter Steege 1989; Montfoort and Ek 1990; Wolf 1993b; Acebey et al. 2003). It is exceeded by a Costa Rican montane cloud forest (Gradstein et al. 2001b), where growth of epiphytic bryophytes is enhanced by the frequent occurrence of fog. These results underscore the high species richness of the studied Sulawesi rainforest. The higher richness of liverworts compared to mosses in our study area is in line with findings in South America (e.g., Florschütz-de Waard and Bekker 1987; Gradstein et al. 2001a) and contradicts the purported predominance of mosses in palaeotropical forests (Gradstein and Pócs 1989). Unusually high species richness in the study area has also been recorded for trees and terrestrial herbs (Kessler et al. 2005; Cicuzza et al. in press) and underlines the importance of the Malesian region as a global biodiversity hotspot (Myers et al. 2000; Sodhi et al. 2004). However, within and between trees, bryophyte species richness as well as composition (see below) differed strongly. The causes for these differences remain unclear and may be due to ecological, historical and stochastic factors (Barkman 1958; Richards et al. 1996; Frahm 1990; Cardelús and Chazdon 2005). Canopy trees had about twice as many species compared to understorey trees, but species richness in the first three height zones on understorey trees (U1, U2, U3) was rather similar to that of zones Z1 to Z2b on canopy trees. Between height zones, however, species richness differed greatly, with lowest values being found on young trees in the understorey and trunk bases of canopy trees, and highest values in the lower portion of the canopy tree crowns (Z3). The latter findings agree with observations in neotropical rainforests (Cornelissen and Ter Steege 1989; Cornelissen and Gradstein 1990; Gradstein et al. 2001b; Acebey et al. 2003), which however lacked data on understorey trees. The approximately 2°C increase of air temperature and ca. 5% decrease of air humidity from the trunk bases towards the base of the canopy (at 14–19 m height) are in general agreement with other microclimate readings in tropical rainforest (e.g., Richards et al. 1996; Walsh 1996; Leigh 1999; Acebey et al. 2003; Kluge et al. 2006). The richness peak in the lower portion of the canopy (Z3) suggests optimal conditions for bryophyte growth in this height zone. Lower down, bryophyte establishment and growth may have been limited by reduced light intensity and higher up by excessive exposure to sunlight and wind. Beside microclimate conditions, bark and branch structure affecting stems flow of water and nutrients may have been important factors determining species diversity (Barkman 1958; Smith 1982; Rhoades 1995). Although bark structure was uniform in our study, unstudied bark factors such as pH, hardness, water holding capacity and bark chemistry (Barkman 1958; Holz 2003; Hauck 2003), may have influenced species richness and composition in this study. The majority of species found in our study (67%) belonged to Lejeuneaceae, Plagiochilaceae, Neckeraceae, Frullaniaceae, Hookeriaceae and Meteoriaceae; all of these are core bryophyte families in tropical rainforest (Gradstein and Pócs 1989). The common presence of species such as Radula javanica, Ptychanthus striatus, Thysananthus spathulistipus, Cheilolejeunea trifaria, Lopholejeunea subfusca, Mastigolejeunea auriculata, Frullania riojaneirensis and Metalejeunea cucullata fits the general description of bryophyte communities of moist tropical lowland and submontane forests (“Coeno-Ptychanthetalia”; Kürschner and Parolly 1999). At a smaller scale, however, species composition changed clearly with increasing height in the tree and species assemblages on tree trunks and understorey trees were significantly different from those in the forest canopy. In accordance with the studies of Wolf (1993c) and Holz et al. (2002) in tropical America, light intensity and air humidity are probably the main drivers of floristic composition of epiphytic bryophytes in the rainforest. Holz et al. (2002) found that light intensity explained over 50% of the variation in bryophyte community structure in a montane rainforest of Costa Rica. Our findings agree with earlier results from tropical America and indicate that phytosociological descriptions of rainforest bryophyte communities without detailed analysis of the forest canopy are incomplete (Kürschner and Parolly 1999). Moreover, epiphytic bryophyte assemblages of tree bases have been reported to be more similar to terrestrial communities than to those elsewhere on the trees (Holz et al. 2002). In the investigated submontane forest in Sulawesi, however, a terrestrial bryophyte layer was virtually lacking, and this is also observed in other tropical lowland and submontane rainforests. While species composition of liverworts and all bryophytes were markedly different on canopy trees and understorey trees, moss composition in the outer crowns of canopy trees (Z5) and in the understorey (U3) showed some similarity. This is probably due to “ramicolous” pioneer species occurring on young twigs in the canopy as well as in the forest understorey (Cornelissen and Ter Steege 1989). Moreover, random dispersal of epiphytic bryophytes may have occurred, for example by small plant parts fallen from higher forest strata into lower vegetation layers. In the wind-exposed outer crown habitats, bryophytes may easily be ripped off by wind and thus be displaced to the understorey trees. Because adaptation of bryophyte species to their optimal microclimatic environment is reflected in their life form, we included the vertical distribution of eight commonly distinguished bryophyte life forms in our study (Mägdefrau 1982). Dendroid forms and fans were most numerous on tree trunks and understorey trees, whereas compact forms and tall turfs were most numerous in the forest canopy and restricted in the understorey to the crowns of young trees (zone U3). These results confirm that species with exposed life forms are more successful in the understorey, where they are well-protected against radiation and desiccation and where their growth form helps them to access as much light as possible. In contrast, species with compact life forms can better cope with warmer and drier circumstances such as those found in higher canopy strata (León-Vargas et al. 2006). Lastly, branch structure such as diameter and inclination of twigs and branches, is an important factor determining the composition of epiphytic bryophyte assemblages of the forest canopy (Yamada 1975–1977; Wolf 1996; Holz 2003). The high number of tall turf species in the canopy may be due to the presence of horizontal braches and crutches, which provide optimal conditions for the establishment and growth of tall turfs. Vertical substrates characteristic for the understorey of the forest appear to be generally unsuitable for these species. In contrast, dendroids, tails and fans, which are generally only narrowly attached to the substrate, are less dependent on horizontal substrates as anchoring places and abound in the forest understorey. We found significant differences in epiphytic bryophyte diversity on tree trunks and young trees in the understorey versus the crowns of the trees; nearly 48% of all species were restricted to the forest canopy trees. Our study was the first to include understorey trees in the analysis of vertical distribution of epiphytic bryophytes using standardized sampling methods. Although no more than 9% of the recorded species were only found on young trees of the understorey, diversity of dendroid and fan-like species was highest on trunks and understorey trees, and would have been underestimated or neglected when the understorey would have been excluded. The importance of young understorey trees as a habitat for epiphytes was earlier demonstrated for vascular epiphytes by Krömer et al. (2007), who found that more than 20% of total species diversity would have been missed when this habitat as well as shrubs would not have been sampled. The results indicate that conservation strategies aimed at preserving the variety of tropical habitats and recognition of suitable indicator species, should consider the understorey trees in addition to the mature canopy trees. Our study once more reveals the importance of undisturbed rainforests with a dense, closed canopy and a well-shaded, cool and moist understorey for the preservation of high levels of biodiversity (Sporn et al. 2009). Disruption of the forest canopy would inevitably risk levelling these habitat differences and pose a threat to the unique bryophyte flora of the forest understorey (Gradstein 2008). Pristine rainforests provide optimal conditions for the development of the specialized bryophyte assemblages detected in this study, including on the one hand those of the shaded understorey and on the other hand those of the exposed and little studied portions of the tree crowns. This study was carried out in the framework of German-Indonesian research program “Stability of Rainforest Margins in Indonesia” (STORMA) funded by the German Research Foundation (DFG-SFB 552, grant to SRG). Support was also received from the SYNTHESYS Project (http://www.synthesys.info) of the European Community. We gratefully acknowledge the support from our counterpart Dr. Sri Tjitrosoedirdjo, BIOTROP, Bogor, the Ministry of Education in Jakarta (DIKTI), the authorities of Lore Lindu National Park and STORMA’s coordinating teams in Germany and Indonesia. Furthermore we thank Arifin, Baswan, Hardianto, Grischa Brokamp and Mina for field assistance and Nunik Ariyanti, Michael Burghardt, Jörn Hentschel and Bastian Steudel for help with collection sorting and identification.